Joe B. is hard at work rehabbing again. This time, it’s an OTSG first, a Montgomery Ward Open Road. Lugged frame, chocolaty metallic paint, plush foam grips—of which I have not sung enough praises lately—and a “quilted” period saddle. NAHBS, eat your heart out. Talk about, “If your bike came from a now defunct department store in the mid ’70s.” – THIS IS IT! 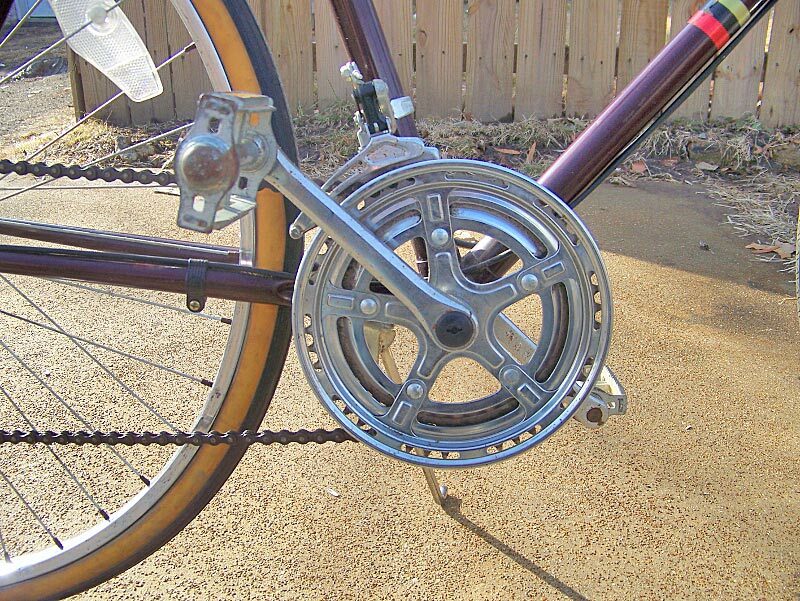 A Montgomery Ward “Open Road” 10 speed; complete with original steel wheels and “Old School” 26 X 1-3/8″ gum wall tires. I picked it up for $10, because the guy basically wanted it out of his basement. After two days of cleaning & tweaking, it works fine! Thanks Cameron! After about a 5-6 mile test ride, I posted it on craigslist for $50. It sold in under two hours. I don’t think I’ve ever seen a Wards ten speed! Really cool. Japanese made, perhaps? IF I remember correctly – made in Korea. That’s a big IF. I suffer from CRS. Just found one of these in great condition at the local dump. There’s a “Made in Taiwan” sticker on the front FWIW. Yeah, thats a nice bike….I found a Montgomery Ward 10 speed at the dump. Tweaked on it a couple of days and its works great. Mine is made in Austria. 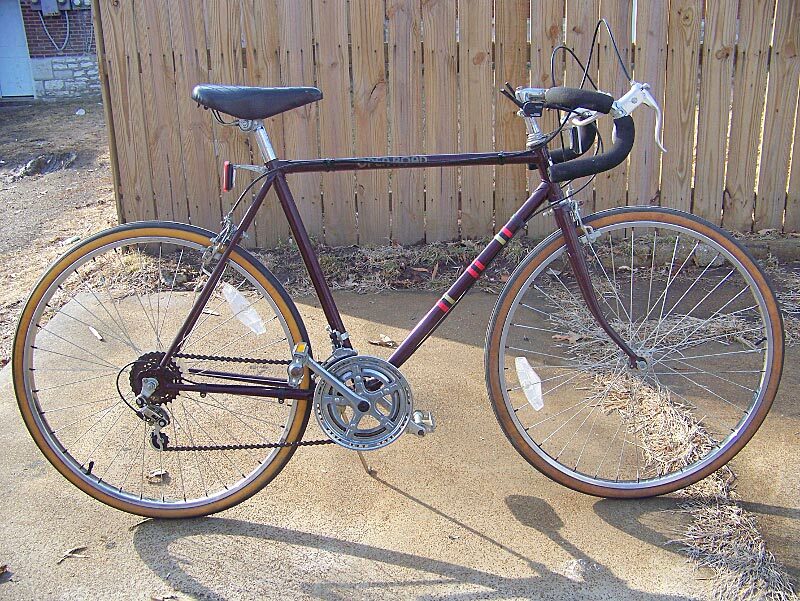 Ihave an old ten speed Purple 27 inch Montgomery Ward ist in perfect running condition. Make Me an offer???? I have on of these in blue that some one gave me. I had to change the back derailer but other then that its a great bike. My mom has had one of these for the longest in our old raggedy garage! Beige/cream colored woman’s 10 speed. Made in Taiwan. I’m thinking about getting it refurbished before I go off to college. I feel like I’m part of some kind of cool vintage bike club now! I am in the middle of rebuilding a pearl black Open Road. I should have it done tomorrow. The thing is absolutely beautiful with only a couple minor dings in the paint. The chrome shines like brand new. Mine was built in Korea. I has no rust on it and one of the original Golden Boy gum-wall tires is still in great shape but the other has a split on the side. Anyone know where I can find one? I will try to post pictures when it is done. BTW, mine has a chrome upright handlebar as opposed to the drops. The shifters are also mounted on the handlebars. I was told it was bought this way in 1976 or 1977, but every other one I have seen has drops and down tube shifters. Any “experts” around that could tell me if they came this way? From my experience, about all of the department store brands were made by other companies as none every manufactured anything. This is especially true of Sears and Montgomery Ward. I was told that the Open Road was made by Schwinn contractors but I cannot verify this as yet. I do know that Schwinn made several bikes for Sears. In fact, I have a couple waiting their turn to be restored! Just dumpster dived an 70s M Wards 10 speed, states made in Austria, simplex components. Anyone know the manufacturer? 10 minutes and it’s already had a creaky but successful (all gears) ride through the neighborhood. I just found a 10 speed Women’s MW Bike in Excellent condition with shemano parts that looks almost exactly like “The Dude.” Is this an unusual find??? I have some pictures of mine all fixed up. I just need the time to post them. 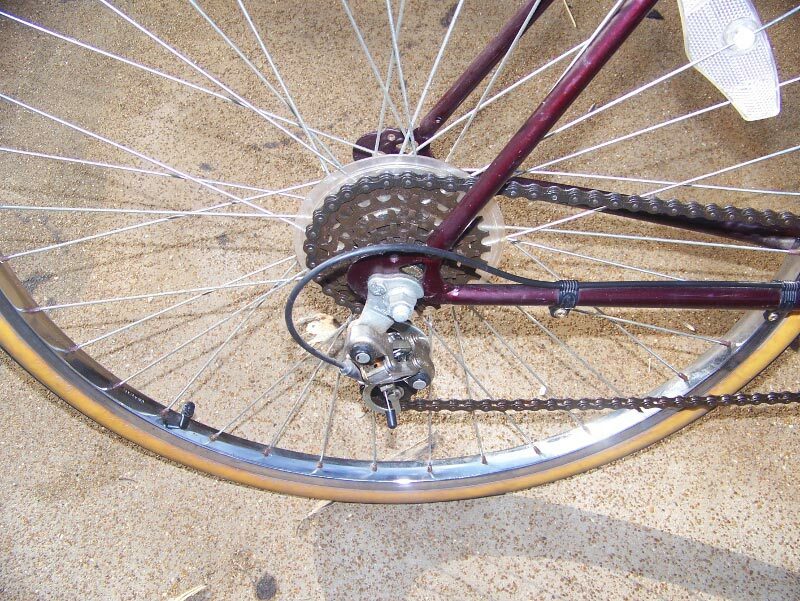 I am also fixing several other old ten speeds including a 19754 Peugeot and several Schwinn’s! Does anyone know what years the Open Road was produced? Some real history on this bike would be very helpful, especially as I am going to be selling the bikes I am restoring. Including the three dozen ten speeds I have over 200 other bikes in various stages of restoration. I have just purchased a MW’S open Road three speed.it’s a women’s three speed.i have not seen one before.i paid five dollars for it.please let me know a little info.it’s in good shape.i can send pics if needed. I got one off of craigslist for $90. I think I paid too much, but it’s a cool red-orange and is the coolest bike. It works really well, but the cables need to be replaced.